SURPRISE! It's me again, back from my terrifying week of nonstop work to tell you another tale of horror that will chill you to your very bones. You will be so chilled, that you'll need to make yourself a cup of hot cocoa and read this under a down comforter. But you'll still be really chilled, so you'll light a fire in your fireplace. But then, after the fire is lit and you begin to warm your hands and feet, you'll remember that you don't have a fireplace. And as you stand there watching your apartment building burn to the ground, your only thought will be, "I am still chilled by that story, and I hope Mr. Whiskers gets out alive." Which bring us to this Friday's frightening tale of fright. What are your plans for Halloween? Well, if you know what's good for you, you will dress up as an important historical figure and go out on the town for a very chaste evening of non-alcoholic daiquiris and square dancing. I really hope your plans don't include working as a counselor at a camp with questionable safety standards. Like the one in this story. Camp Trip was the most dangerous camp of all time. Not only was it located in the heart of Man-Eating Grizzly Bear Woods, which, as you've likely guessed, was filled with man-eating grizzlies, you had to drive down a long pot hole-filled road to get to it, as the camp's owner was too cheap to have the road repaired. And when you finally got there, you were faced with the worst safety standards of all time. There were jagged tree stumps near all the paths and frequent food poisoning in the dining hall. Cabin walls and floors were filled with rusty nails. On the first day of camp, each camper was given a hammer and an ax and told, "If you see a rusty nail, use your hammer to fix it. Also, you're going to be chopping your own firewood. Good luck!" It was these poor safety standards that resulted in the death of a camper at Camp Trip many, many years before when the tarp that was used in place of a cabin roof fell onto his bunk and suffocated him to death. To make things even more dangerous at camp, despite being dead, that dead camper was hell bent on revenge and ran around camp every night after dark slaughtering campers and camp counselors willy-nilly with his wood chopping ax, rather than seeking the therapy he clearly needed. As darkness fell on the first night of camp, everyone was digging into their evening meal of undercooked chicken and potato salad that had sat out in the sun all day. The campers were all talking about how much fun they had had at the grenade throwing range that afternoon and how they couldn't wait to go horseback riding the next day because they heard that rather than buying and training horses, the camp owner just put out oats and opened the stable doors, letting in whatever horses might be interested in a meal that night. But unbeknownst to those excited campers, none of them would live to see the next day. As the first camper began to feel the first grumblings of food poisoning in her stomach, the lights in the dining hall suddenly went out. "Oh, no!" you're thinking, "The evil undead camper has come to the dining hall with his ax to slaughter everyone!" But you are wrong. It was just the faulty electrical wiring. "Someone call somebody to fix this!" called one camp counselor. "The phone lines are down!" said another counselor. "The undead camper cut the lines!" you're thinking. But no, it was because the camp owner didn't pay the phone bill that month. "Does anyone else see that menacing ax-wielding shadow outside the dining hall window?" asked one of the campers. "Just the shadow of a tree, I suppose?" you say, but you would be wrong. It was actually the undead and revenge-seeking camper this time. "We must barricade the doors!" Working quickly, the campers and counselors moved the tables over to block the doors and windows. "What if he tries to come down the chimney?" called a terrified camper into the darkness. "Quick! Light a fire in the fireplace!" said one of the counselors, handing a box of matches and a can of gas to a camper who was wearing an eye patch after falling face first onto a jagged tree stump. "But we don't have a fireplace!" said the eye-patched camper. "Then, light the fire over there in the corner!" cried a terrified camper with only one arm, who had unfortunately discovered that afternoon that his horse was a man-eating grizzly. "Hey," you're saying, "Why are they afraid of the murderer coming down the chimney if there's no fireplace?" Because they were not trained properly on what to do in case of an emergency. Let that be a lesson to you. Read on. 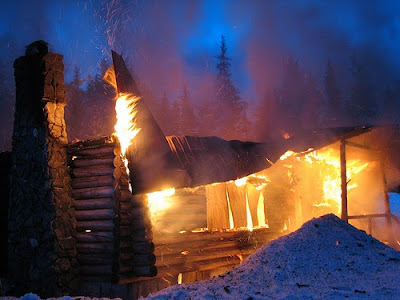 Now, as any good camper knows, you should never, ever light a fire indoors if you don't have a proper fireplace. For one thing, you could light the whole dining hall on fire. Secondly, you could be asphyxiated. Thirdly, running away from flames causes you to metabolize the salmonella in your system more quickly, causing instant projectile vomiting. And nothing creates more dangerous safety standards than vomit-covered floors and a blazing inferno. As you've likely guessed, the campers who didn't die of food poisoning were asphyxiated or unable to escape the blaze because large dining tables were blocking all the exits, which anyone trained properly in safety standards would know never to do. The ax-wielding undead camper just stood and watched the drama unfold from outside where the air was rich with oxygen and thoroughly cooked meals. And as he stood there, he thought, "I should really seek therapy. It's obvious that I'm still upset by that tarp suffocating incident. And, hey, why am I alive right now if I died?" So, he dropped his ax and stalked away into the woods to seek medical attention and therapy for his problems. You'll be pleased to hear that he eventually found closure. You'll also be pleased to know that the fire that consumed the dining hall also helped to cook the chicken properly at last, killing all of the bacteria swimming around on it. Unfortunately, no one was left alive to eat it. LOL... Oh my gosh that was frightingly hilarious. I will definately be coming to read more of your blogs. @Nava: Oh, thank you very much! I'm flattered. Hey Beth, the other night I had a dream about Tarantula Kittens. I figured you could use the imagery for one of your frightening Fridays someday, or maybe Tarantula Kittens will inspire you in some previously unforeseen way. Actually, I just like writing Tarantula Kittens.